Linear? I Hardly Knew Her! Before I begin today’s article, I just want to say that I will not be posting any new articles for the next two weeks, because I am getting married! Next week is my wedding, and the week after that is my honeymoon. After that, I will continue to post every Thursday as usual. Last week I began a series of articles about designing custom Magic: The Gathering sets with an emphasis on drafting (if you missed it, you can find it here). 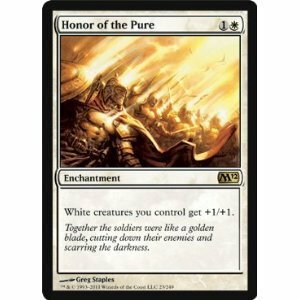 In that article, I took a broad look at a number of different factors that I thought would be relevant to designing a set for draft. I examined a number of different Magic sets based on those different factors, and gave my thoughts along with the data that I was able to find. While that article was a shallow overview of the topic, in future articles I am going to be examining each of these different criteria much more closely. Today I begin this analysis with the topic of modular and linear cards. For those who are not as familiar with these topics I will provide a general overview of what these terms mean, and why they are important in game design. Then, at the end I will include my in-depth analysis of the same six Magic sets as last week. Some of you may be wondering what I mean when I talk about “linear vs modular cards”. Basically, these terms represent how much a card relies upon specific other cards in order to function. In Magic: The Gathering, an example of a very modular card would be Divination. This card’s text is very simple – “Draw Two Cards”. Because this card is so simple, all it really requires is that you have cards in your deck to draw. Because Magic has a minimum deck size of 60 cards, this is not much to ask. Divination is extremely modular, and can reasonably go into any deck that can afford it’s mana cost. On the other side of the spectrum is a card such as Endless Ranks of the Dead. This card creates zombie tokens every turn equal to half the number of zombies you already control, rounded down. Because this card rounds down, if you control 0 zombies this card does nothing. If you control a lot of zombies, however, this card can be incredibly powerful. This card is linear because it’s power heavily depends on what other cards you have in your deck. It relies on zombies in order to function, and this card strongly encourages you to fill your deck with as many zombies as possible. Linearity and modularity are not binary – there is no clear dividing line that determines whether one card is linear or not. Instead, it is more of a spectrum with varying different degrees. On one end of the spectrum are cards that are almost completely modular with almost no restrictions. On the other side are cards that are incredibly linear, and have very specific circumstances that they are useful. To show this a little more clearly, I have decided to create a rough scale that can be used to determine how linear a certain card, mechanic or theme is. A card that gets a 0 is perfectly modular. It could fit into absolutely any deck with no difficulties. It has no restrictions except those that are dictated by the rules of the game itself. To be a perfect 0, a card shouldn’t even be restricted by color. To achieve this, it should either not reference color at all (including colored mana costs), or it should be adaptable to work with any color. A perfect example of a 0 is Black Lotus. 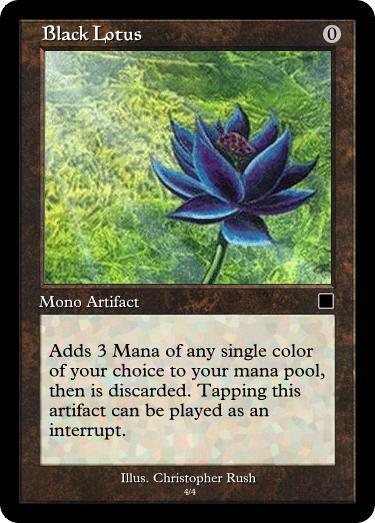 Black lotus is a 0 cost artifact that can be sacrificed to create 3 mana of any color. While there is nothing wrong with perfectly modular cards, I believe that designers should be careful about what power level they are printed at. Because any deck is capable of using them, if too many perfectly modular cards are too powerful it can have very negative effects on the game. Firstly, it can cause decks to become extremely similar, and reduce the variety of gameplay because everyone is using the same cards regardless of deck type. It can also damage the secondary market for the game, causing the price to skyrocket and potentially leading to shortages. For an example of what this could look like, look no further than Mirrodin and the prevalence of Affinity decks. Because the most powerful cards were all artifacts, players were able to throw them all into their decks with no restrictions. This led to a very degenerate tournament environment, and eventually led to a number of cards being banned or restricted in multiple different formats. A card that is a one on the linearity scale is still extremely modular, and can fit in a variety of decks. A one can have colored casting costs, but other than that should only care about things that are intrinsic to the game. These include cards in your hands and deck, your life total, your graveyard (in a general sense), spells, and lands. Divination, mentioned above, is an example of a one. It is a colored card, so any deck that includes it must be capable of producing blue mana, but besides that any deck could reasonably include it. A two is a card that cares about things that are incredibly common to the game, to the point that almost every deck will have them. Caring about creatures is a 2, because almost every deck will include at least a few creatures in it. Caring about basic lands is also a 2, because most decks will include some basic lands. Other things that count as 2 include caring about permanents, caring about about colored spells, or caring about non-creatures. While there are some exceptions, most decks will have these things so cards that care about them generally don’t affect your deck-building too much. An example of a 2 is Giant Growth. Giant growth has the ability “target creature gets +3/+3 until end of turn”. This card requires the player to be able to pay green mana, and it requires them to have a creature to pump up. It doesn’t care about what kind of creature it pumps though, and is a card with a lot of uses. It can be used to push through extra damage if unblocked, it can be used to defeat an opponent’s creature when blocking or blocked, or it can even be used in combination with a spell that cares about power/toughness. It is a very modular card with a lot of possibilities. A three on the list is any card that, while referencing something that you are already likely to have, can still affect your deck-building by encouraging you to include more of them than you might already. A common example of a 3 is a card that cares about it’s own color or basic land type. A red card that deals damage based on how many mountains you control, for example, would be an example of a 3. While you probably already have mountains in your deck in order to pay for the card in the first place, it can still encourage you to include more red cards than you otherwise would. A good example of this is Honor of the pure. This card has the ability “White Creatures you control get +1/+1”. Because this card is white, it is likely that you have other white cards in your deck, including creatures. In order to really get the most out of this card, however, you are encouraged to include lots of white creatures in your deck. This card does more than just support your strategy – it pushes your deck in a particular direction and affects your deck-building decisions. By the time you get this far up the scale, you start to see cards that care about things that are not likely to already be in your deck, or at least not in a very large amount. Cards that count as a four include cards with off-color activations, and cards that care about specific non-creature, non-land permanent types. A card with an off-color activation is much more linear than a card that cares about it’s own color because instead of simply requiring one color to play, it pushes you towards a specific two color combination. Technically you could still play that card without the ability to activate the off-color activation, but it generally is not at a high enough power level to be worth using unless you have access to it’s full potential. Cards that care about a specific card type are a bit different because most decks will generally have cards of that type already, but only in small amounts. Most decks will include a few instants, for example, but if you have a card that automatically doubles all of your instants then you will probably include many more of them in your deck than usual. This also extends to artifacts, planeswalkers, and enchantments – your deck might include a few, but not enough to care about them unless you specifically build your deck around them. Whats better than one fireball? TWO FIREBALLS! Fives are just about as linear as a card can get. A five cares about specific subcategories of cards, and strongly encourages players to build their decks around this subset. Common examples of fives include “tribal” cards that care about a specific creature sub-type, but they are not limited just to creatures. Fives can care about non-creature sub-types as well (auras, arcane instants and sorceries). Fives can also care about events that do not happen often in normal gameplay (“Whenever a player sacrifices a creature…”) or about cards that have a specific shared ability (“Target instant with flashback can…”). Endless Ranks of the Dead, which I talked about earlier in the article is an example of a 5. Even more linear than fives, sixes are cards that refer to other cards by their specific name. These cards are the epitome of linearity, and they literally spell out what cards they should be played with. These cards are quite rare in Magic: The Gathering, but they do exist. An example would be the “Urzatron”, a series of 3 cards that all reference eachother by name. These cards (Urza’s mine, Urza’s Tower, and Urza’s Power Plant) are all lands that produce one colorless mana on their own, and multiple when together. By themselves, these cards are outdone by basic lands, but together they can produce 7 mana with only 3 lands. They are about as linear as you can possibly get in this game – alone they are useless, but together they are incredibly powerful. This scale is really only useful for determining how linear a particular card is, but is not as useful for examining entire mechanics. Much like cards, mechanics can be on a spectrum based on how modular they are, but there are a number of differences. Unfortunately, I do not have room to get into those differences in this article, but if you readers are interested let me know and I should be able to get into it sometime in the future. Now that we have all looked at what makes a card linear vs modular, some of you may be wondering why you should care. Does it matter how linear or modular my set is, as long as the cards are good? And the short answer is yes, it matters a great deal. A set needs to have the proper mix of linear and modular cards in order to be successful. Linear cards help provide direction for the players. When a player opens a linear card, it should spark ideas about what kinds of cards would work well with it, and what kind of deck could include it. Linear cards also help make each set feel unique, because each set can encourage the player to care about different things that they might not care about. Lorwyn and Innistrad, for example, both had tribal components but cared about very different types of creatures which created a very different feel across the two sets. Without a certain threshold of linear cards telling players what to care about, sets begin to feel generic and boring. Too many linear cards, on the other hand, can be just as limiting. If every card cares about a specific other subset of cards it can eliminate a lot of the creativity that comes from deck-building. It replaces the challenge of coming up with unique deck ideas with a paint-by-numbers process of finding all of the cards that deliberately work well together. This reduces the number of possible decks, and can reduce enjoyment of the set. This is especially damaging in limited, as you can basically force players to choose a theme right at the beginning and hope that they can get enough cards to make that theme work. While a set needs to contain a mix of linear and modular cards, finding the right mix can be a challenge. In order to find a general guideline, I dived back into the same six sets I looked at last week. This time, instead of looking at a dozen different categories I only analyzed them for one – linear cards. I studied each set, and counted the number of highly linear cards (four or higher on the above scale) I could find. I also kept track of the rarity of these different cards, and calculated the as-fan of each set (as-fan is the number of cards with a certain property you can expect to see when opening a pack of cards, on average). The results are below. For those who don’t want to dig through all of that data, here’s the takeaway. Out of the six sets that I analyzed, they all had between 5.6% and 17.2% linear cards, and an as-fan between 0.9 and 2.5. This is a surprisingly small window, and for the top three sets the range was even smaller. Among the top three sets, the percentage was between 13.8 and 16.9% and the as-fan was between 1.4 and 2.5. While this is a relatively small data set, I still think that the results can be quite useful. It gives a general guideline for the percent and as-fan of linear cards that a set should roughly shoot for (about 15% and 2 respectively). All of the top three sets are near these marks, while two of the bottom three sets are significantly below this range. That’s about all I have for today. If you found this blog interesting, feel free to subscribe to the blog or follow me on twitter @RemptonGames so that you can always be alerted when I post a new blog. If not, please let me know what you think I could do better in the future – I appreciate any and all constructive criticism. Because of my wedding I will not be posting any new articles for the next two weeks, but join me in a few weeks when I dig into the design of cooperative games. What do you think of linear/modular cards in Magic? Do you think that it needs more linear cards? Fewer? Or do you think that it has about the right amount? What do you think of cooperative games from a player’s perspective? Are you a fan of these types of games? What are your favorites? What are some of the biggest pros and cons of cooperative games from a design perspective?